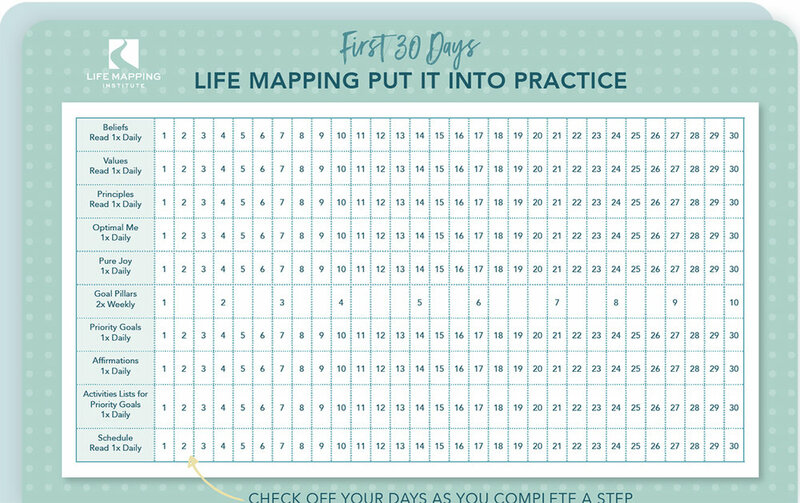 This form sets the stage for your “top-priority goal,” giving you the full picture of where you want to go and what you need to do to get there. In-depth questions based on the latest research ensure you’re priming your mind-set to support your goal and overcome limiting beliefs. When you know what your core values are, it's much easier to have clarity around your purpose and goals. Research suggests we're more apt to reach our goals if they're supported by one or more of our core values. Crack the Boulder is the easiest way to start chiseling your larger goal into a manageable list of tasks. Use it to identify a worthy focus goal and then set target dates of completion for each. This form is designed to help you set your sights on what needs to be accomplished so you can choose where to start. Anything worth learning and integrating into our daily lives requires practice. The review card should be posted where you can see it. It's a reminder and tracking system for blending the life mapping tools with your daily life. The Today worksheet will keep you organized and focused on your top priorities. Start your day off right by remembering those things for which you are most grateful. Then list your to-dos for the day, note any contacts you need to make, and check off your daily tasks.